WASHINGTON — Massachusetts Senator Elizabeth Warren has already amassed a $9.2 million war chest for her reelection bid, setting a dauntingly high bar for any Republican considering challenging her. With Election Day still a year and a half away, Warren raked in $5.3 million during the first three months of the year, according to numbers Warren’s campaign provided to the Globe. Much of that money came from small-dollar donors: Checks for $50 or less made up more than 92 percent of the individual contributions; checks for $25 or less comprised more than 76 percent of the contributions. Warren’s haul is the latest sign of the anti-Trump energy that’s fueling liberal activism, and campaign donations, around the country. Those small-dollar sums suggest Warren’s popularity remains strong with a very much engaged Democratic base at home and beyond, even if her recent statewide poll numbers look a little soft. Warren posted on Facebook Tuesday that close to 16,000 Massachusetts residents sent her money, including a map of small blue pins marking the location of each. Warren’s campaign did not disclose the total number of donors, but said that about a quarter of the total money raised in the three-month period came from Massachusetts residents. The full details of Warren’s first quarter fund-raising report will be available when she files it with the Federal Election Commission. The deadline is April 15. For comparison sake, Warren’s tally of nearly 16,000 in-state Massachusetts donors alone is almost equal to the total 18,000 Texas and national contributors to GOP Senator Ted Cruz of Texas, who also enjoys a national fund-raising network, bolstered by his unsuccessful presidential bid. Cruz raised $1.7 million in the first three months of 2017, according to Politico. Cruz, who faces potentially tough primary and general election challenges, has about $5.2 million cash on hand. Trump-fueled liberal activism is evident in the fund-raising of Democrat Jon Ossoff, and the unprecedented $8.3 million he pulled in during the first quarter in his bid to win the April 18 special election to fill the suburban Atlanta House seat vacated by Health and Human Services Secretary Tom Price. With his pitches to voters to “Make Trump Furious,” the 30-year-old former congressional staffer is within striking distance of winning a district that has been reliably Republican for decades. Warren had a notable turn in the national spotlight in February that may have helped boost her fund-raising. Senate Republicans formally silenced her, blocking her from speaking further, during debate on Jeff Sessions’ nomination to be attorney general after Warren read a decades-old letter criticizing him written by Coretta Scott King. Republicans said she had broken chamber rules by impugning the conduct and motives of Sessions, then a fellow senator. The moment went viral. “She persisted,” a phrase Senate Republican leader Mitch McConnell used to explain why he was moving to block Warren, became a liberal rallying cry — and a hook for multiple fund-raising pitches for Warren and Democrats more broadly. It took MoveOn.org about 12 hours to raise more than $250,000 on Warren’s behalf, from 9,000 donors. The Democratic Congressional Campaign Committee raised $767,000 online with appeals linked to the incident in the 48 hours that followed. The overall impact on Warren’s own fund-raising will be clearer when her full report is filed. 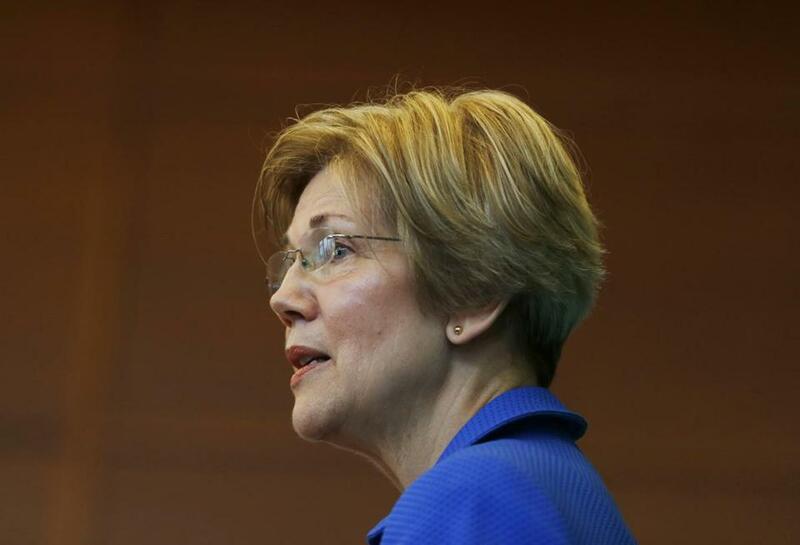 Warren’s poll numbers have weakened somewhat, which could help tempt Republican challengers. Fifty-six percent of Massachusetts voters said they approved of Warren’s job performance, while 38 percent disapproved, in a Morning Consult poll released Tuesday. It’s a dip from April 2016, when the same poll found 61 percent of voters approved versus 27 disapproved. “Massachusetts voters have spent the last few months watching Senator Warren vote against home-state interests like more funding for the opioid crisis, and engage in the partisan grandstanding that’s typical of DC insiders. So it’s not a shock that this latest poll shows her constituents are getting tired of her act,” said Kirsten Hughes, the state GOP chairwoman. Hughes’ comment on opioid funding refers to Warren’s opposition to a medical innovation bill called the 21st Century Cures Act, which included some money for states to battle the opioid crisis. Warren objected to what she considered too many giveaways to pharmaceutical companies in the bill and a lack of guaranteed medical research money. It’s unclear who Warren will face in a general election contest. Republican state Representative Geoff Diehl, a conservative who worked for President Trump’s campaign, took a big step forward earlier this month, launching a formal exploratory effort. Major Republican donor John Kingston is mulling his own campaign. A local computer scientist some credit with inventing e-mail, Shiva Ayyadurai, has announced he is running against her. Warren has said she would like to sign a new “People’s Pledge,” like she inked with Scott Brown in 2012, to keep third-party advertising out of the race. That could be a tough pill for any of her potential GOP opponents to swallow when they look at how much she already has in the bank. Of course, Warren’s fund-raising prowess is no secret. At the peak of her 2012 race, she pulled in $8.4 million between August and the end of September, according to FEC filings. Her first-quarter 2017 small dollar fund-raising is on pace to beat her previous track record. In 2012, half of Warren’s contributions came in the form of checks for $25 or less, while more than 80 percent were in amounts of $50 or less.